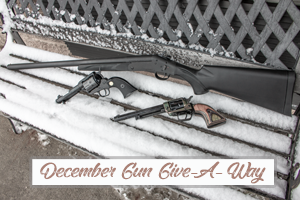 The final firearms will be your choice of a Chiappa SAA 22-10 22 LR 4.75″, Matte Black, the Savage Arms Stevens 301 Single Shot 12 GA 26″, Black, and the Heritage Rough Rider Small Bore 22 LR 6.5″, Blued Frame, Laminate Grip. Please read the rules below to find out how you can have a chance to win. The rules are simple: 1 chance to win for every 4 hours of a Red Dot Arms Training Class you attend. The December contest starts December 1, 2018 and ends December 31, 2018. A winner will be drawn on December 31, 2018 for classes that were attended during these dates. This is the last Gun Give-A-Way! Winner must have a valid FOID card or out of state driver’s license. Winner must be at least 21 years of age to qualify and will need to complete appropriate firearm transfer paperwork. Winner is subject to waiting period, per Illinois State and federal law. Out of state winners are responsible for FFL transfer fee. Red Dot Arms will pay for the shipping fees. Red Dot Arms employees are excluded from the contest. We reserve the right to substitute if a firearm is sold out. We will contact the winner. Good Luck and start signing up for Red Dot Arms Training Classes!